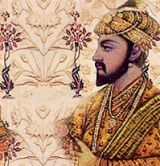 Shahbuddin Mohammed Shah Jahan (January 5, 1592 � January 22, 1666) was the ruler of the Mughal Empire in India from 1628 until 1658. The name Shah Jahan comes from Persian meaning "King of the World". Shah Jahan is best known as the builder of the Taj Mahal, a shrine to his Persian second wife, Arjumand Bano Begum, popularly known as Mumtaz Mahal ("Ornament of the Palace") whom he married on May 10, 1612, at the age of 20. Shah Jahan was born with the name Prince Khurram to Jahangir and the Hindu Rajput Princess Manmati, and was reportedly close to his grandfather Akbar as a child. Khurram raised an army against Jahangir in 1622, but the insurgency failed. He was forgiven and accepted back into the fold but two of his sons, Prince Aurangzeb and Dara Shikoh, were sent to Jahangir's court against the possibility of Prince Khurram revolting again. After Jahangir's death in 1627, Khurram captured power after a fratricidal war against his weaker brother, Shahryar, who was supported by Jahangir's powerful widow Nur Jehan with the help of Abdul Hassan Asaf Khan I . It was shortly after this that he took the rule name Shah Jahan, February 4, 1628. Although his father's rule was generally peaceful, the empire was experiencing challenges by the end of his reign. Shah Jahan reversed this trend by putting down a Muslim rebellion in Ahmednagar, repulsing the Portuguese in the Bengal, capturing the Rajput kingdoms of Baglana and Bundelkhand to the west, and the kingdoms of Bijapur and Golconda in the Deccan and the northwest beyond the Khyber Pass. Shah Jahan's military campaigns drained the imperial treasury. Under his rule, the state became a huge military machine and the nobles and their contingents multiplied almost fourfold, so did the demands for more revenue from the peasantry. However, his political efforts encouraged the emergence of large centers of commerce and crafts--such as Lahore, Delhi, Agra, and Ahmadabad--linked by roads and waterways to distant places and ports. He moved the capital from Agra to Delhi, the traditional seat of Muslim power. Under Shah Jahan's rule, Mughal artistic and architectural achievements reached their zenith. Shah Jahan was a prolific builder with a highly refined aesthetic. He built the legendary Taj Mahal in Agra as a tomb for his beloved wife, Mumtaz Mahal. Among his surviving buildings are the Red Fort and Jama Masjid in Delhi, the Shalimar Gardens of Lahore, sections of the Lahore Fort and his father's mausoleum, Jahangir mausoleum. Although the empire's financial expenditures were excessive when resources were shrinking, by the end of Shah Jahan's reign, the empire was again expanding. When Shah Jahan fell severely ill beginning in 1657, the struggle to succeed him began. His second son, Shah Shuja declared himself emperor in Bengal. Aurangzeb also challenged his father and the expected successor, Dara Shikoh, Aurangzeb's elder brother. Despite strong support from Shah Jahan, who had recovered enough from his illness to remain a strong factor in the struggle for supremacy, and Dara's victories over Shah Shuja, Aurangzeb finally defeated Dara. Dara attempted to rally support after this defeat, but was betrayed and turned over to his brother. Aurangzeb beheaded Dara Shikoh on the charge of heresy and, it is said, had his severed head taken to their father. He also ordered the execution of his brother Murad Baksh, who had briefly fought along with Aurangzeb against Dara Shikoh in the battle of Samogarh. Aurangzeb put his father under house arrest in Agra Fort tended only by his eldest daughter Jahanara Begum. The conditions of Shah Jahan's five years detention are the subject of disagreement and legend. Some say that the Fort was a luxurious residence, others say it was restrictive. Aurangzeb permitted him to retain "the whole of his female establishment, including the singing and dancing women" (Bernier, p.166 and p. 21) Legends include one that says that though the Taj is not directly visible from the Sheesh Mahal (Agra) in the Agra Fort, it is constructed such that it can be seen in its multitude of mirrors. It is also rumored that Shah Jahan died in Muasamman Burj, a tower with a marble balcony with an excellent view of the Taj Mahal. Note that these stories are directly contradictory.